Now my workbench looks nothing like any of these, In fact I made mine in an afternoon out of softwood, an OSB top that was leftover from another project and a bit of MDF for the shelf. The idea was that I needed a workbench to be able to build “The” workbench. Well I’m still using that workbench, but in the back of my mind I still dream of building my own “proper” workbench. It will be constructed from beautiful, interesting hardwoods and have all the features that I need. And most importantly it will look so good that I wont ever want to use it. 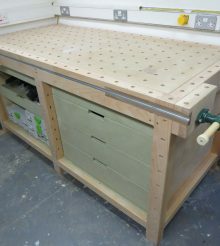 I am often torn between the features and style of the more traditional workbenches as listed here and the more modern workbenches that incorporate router tables and Festool style MFT functionality. Oh well, I guess I’ll just have to build two. I found this on the Pitsford Lumber website. It was a customer project of Charles Davis of CD Woodworks. Made from Ebony, Walnut and Zebrano. 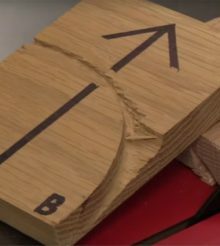 The Zebrano used in the tail vice is beautiful. Charles also opted for an enclosed storage area under the bench. This really is a work of art. This is a beautiful split top Roubo style workbench from Dozer57 over at LumberJocks.com made from Oak plywood, red Oak and Walnut. Check out the link to see more build pics and details. Here we have a stunning workbench from DavidMc over at finewoodworking.com. Its made of of Maple, Oak, Black Walnut, and Purple Heart. The Purple Heart on the front and tail vices are a very nice touch. and the drawers provide plenty of storage and organisation for hand tools. This is thorreain’s workbench which I found over at LumberJocks.com it’s a very detailed build thread so definitely worth checking out. Here is another one from LumberJocks.com. The table is made predominately of Maple and Cherry with African blackwoods for accents. A beautiful and very heavy workbench. Here is the July 2014 Workbench of the month winner from Lake Erie Toolworks made from Ash and Walnut and weighing in at approx 500lb. 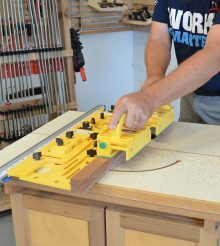 The Lake Erie Toolworks website has some great workbenches and is definitely worth a look. Another workbench from Lake Erie Toolworks. 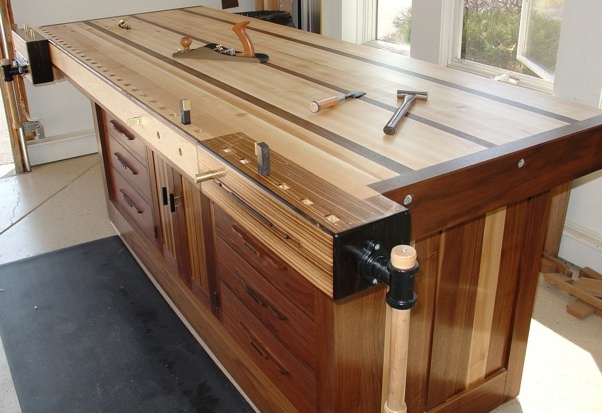 This was Lake Erie’s December 2013 workbench of the month, built by Duncan Robertson. It’s mostly made out of Maple but has Cherry and Vietnamise Rosewood to add accents. The Houndstooth Dovetail joint on the tail vice looks gorgeous. You can read more about this build here. Her’s another one from LumberJocks. This was a project of LumberJocks user lysdexic. The top is predominately maple and the legs are Cherry. I would definitely recommend checking out the link as there are a lot of great features on this bench. The bottle opener is a nice touch. If you have or have seen an amazing workbench please send me the link by adding a comment below.